Yes, Revenge of the Sith is making a lot of money. According to this site, after just 9 days, Episode III took in more money than Ep. V: The Empire Strikes Back did in its entire release. And on day 11, Ep. III passed the all-time gross of Ep. VI: Return of the Jedi. Of course, ticket prices are much higher now. But still. More fun: Episode III Easter eggs. 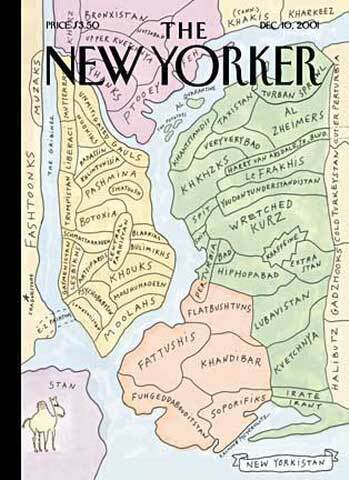 In 2001 the New Yorker published this brilliant "New Yorkistan" cover. I have a ratty photocopy of it, which I found on a wall at Microsoft in Redmond, of all places. Apparently, prints exist, but I have yet to track one down. Tonight is the season finale of the TV show Lost. I liked this show a lot when it first appeared. It carried a whiff of surreality, featuring such goodies as a jet engine gone wild, a polar bear, a former paraplegic who could suddenly walk, and an unseen monster that occasionally terrorized the castaways. But then, some months ago, things began to slow down. Like the island where the castaways are marooned, the show has been reluctant to give up its secrets. We'll see what happens tonight. Last weekend the San Francisco Giants honored their great Dominican pitcher, Juan Marichal, by dedicating a statue in his honor at the ballpark. 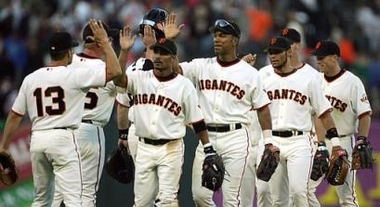 As a further tribute to Marichal and all their great Latin American players, the team wore jerseys reading "Gigantes". 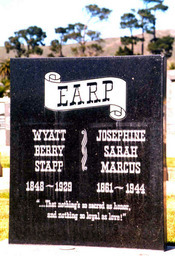 Wyatt Earp, one of the most famous figures of the U.S. Old West, is surprisingly buried in a Jewish cemetery south of San Francisco, next to his wife, Josie Earp. (She was Jewish, he was not.) Wyatt Earp is best known for surviving the shootout at the O.K. 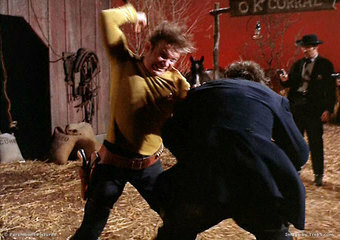 Corral when Captain Kirk decided to stop beating the hell out of him. Apple's new Dictionary is available as an application and a Dashboard widget. You can also summon the Dictionary by highlighting text, Ctrl-clicking, and choosing Look Up in Dictionary. For super-power users, there's an even quicker shortcut: hover over text and press Ctrl-Command-D to see the Dictionary panel, a tiny box that defines the word and includes buttons to switch between dictionary and thesaurus and to start the full Dictionary application. (You can use Keyboard & Mouse Preferences to change Ctrl-Command-D to something else if you want. Recently I saw and enjoyed The Hitchhiker's Guide to the Galaxy movie. Although it wasn't the incredible revelation that the original radio play, BBC TV series, and books were -- and how could it be? -- it was fun. I liked that the filmmakers seemed to be respectful of Douglas Adams and the original works. For example, the lovely banjo-tinged theme from the BBC series turns up a few minutes into the movie. A few days later, I read on my friend CJ's blog that the TV theme was actually a song called Journey of the Sorcerer by none other than The Eagles. I figured she meant the theme was based on an Eagles song, or was similar to an Eagles song, but a quick trip to sample the song at the iTunes Music Store revealed that the HHG theme was exactly the original Eagles song. I like the Eagles just fine. And I like Hitchhiker's Guide a lot. But I like them in entirely different regions of my brain. I just never thought of them together. The Hitchhiker's Guide is cosmic and self-deprecating. The Eagles are pretentious and definitely non-cosmic. This is such an awesome, juicy triviality that it seemed impossible that I, a member of the Trivia Bowl Hall of Fame, was unaware of it. Over the past weekend my family and I were in North Hollywood. If you're not familiar with LA geography, North Hollywood is not Hollywood: the former is in the San Fernando Valley, and the latter is across the Santa Monica Mountains in the LA basin. (As my friend Andy Stadler says: "The problem with North Hollywood is that it's basically just West Burbank.") When we're out of town, we always try to avoid chain restaurants and get some local flavor instead, which is not always easy to do with kids. On this trip, we found two gems: Art's Deli and Miceli's. At Art's, in Studio City on Ventura Blvd., we had wonderful corned beef, kosher salami, and potato knishes, along with a nice Dr. Brown's Cream Soda. Miceli's, a crowded Italian place in Universal City on Cahuenga Blvd. (which is the same street as Ventura after its name changes), featured great pizza, delicious hot rolls, and a terrific misto salad, along with live waitress singing and a general fun (but not too fun) atmosphere. I highly recommend Art's Deli and Miceli's if you find yourself in the valley looking for great family food.